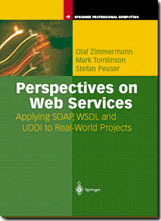 This book is designed as a full and rich source book for architects, developers and project managers of Web services projects. The book is written by experienced practitioners. The text is accompanied by a realistic case study which leads the reader through a complete project lifecycle. J2EE and the IBM WebSphere product family serves as the sample implementation platform for the introduced concepts. "...I certainly wish I´d had this book at my disposal, for it would have definitely made my life a whole lot easier." Publications and presentations by Dr. Olaf Zimmermann are listed on his IAAS page. This is his personal page at the Institute for Software at HSR FHO and this is his public LinkedIn profile. Information about the SOA Decision Modeling (SOAD) project can be found here. The SOAD thesis turns 10 now and PoWS will turn 16 soon. Much has happened since then. Hence, this website will no longer be updated. Please consult Olaf Zimmermann's website and his LinkedIn presence to learn about latest projects and resources. Research on Architecural Refactoring and Architectural Decision Guidance across Projects (to be) presented at WICSA, ICSE SAM, and SummerSoC. Presentations and paper PDFs available from ARC project website at HSR FHO IFS. Seeking your Insights! Consider sharing your story or submitting an experience report for Insights column in IEEE Software. Architectural decisions recurring in workflow design presented at 8. Arbeitstreffen Architektur (Softwareforen Leipzig). Knowledge Hubs and Method Guidance now featured at website of IFS project Architectural Refactoring for Cloud at HSR FHO. More results from the research project Architectural Refactoring for Cloud presented at Architekturen 2014, the annual meeting of "GI-Fachgruppe Architekturen" that will be hosted by ABB Corporate Research in Ladenburg, Germany (July 7-8, 2014). Olaf Zimmermann presenting on cloud computing patterns and ideal cloud application architectures at Open Cloud Day organized by the Swiss Open Systems User Group. The European Conference on Software Architecture (ECSA) comes to Vienna, Austria, this year. August 27 is ECSA 2014 Industry Day, featuring high-profile speakers on API management, architecture modeling, big data, SOA evolution, and other trends and topics. First results from the new project Architectural Refactoring for Cloud will be presented at the IBM DeveloperDays 2013 (Zurich, November 20, 2013) as well as two sessions at OOP 2014 (Munich, February 3-7, 2014). IEEE Software magazine's Software Experts Summit 2013 takes place on July 17 in Redmond, Washington, USA. Theme: Smart Data Science - Harnessing Data for Intelligent Decision Making. Olaf Zimmermann will participate in a panel on Big Data in Context..
New attendance record for SEI SATURN set. Olaf Zimmermann, program co-chair of SATURN 2013, hosts a BoF session on architectural decision modeling and reuse. Available now: Text book on Aligning Enterprise, System, and Software Architectures that includes a chapter that shows how to integrate SOAD into TOGAF. The chapter is available online. SOAD featured at WICSA/ECSA SHARK 2012 and in JSS special issue Selected papers from the 9th Working IEEE/IFIP Conference on Software Architecture (WICSA 2011). The author copies of these two final SOAD papers can be found via the SOAD tab. Olaf Zimmermann delivered an IEEE Software talk at SEI SATURN 2012, which introduced a lightweight Y-Approach to Architectural Decision Capturing. Olaf Zimmermann elected into Advisory Board of the IEEE Software Magazine. Check out the Digital Edition and consider a submission! SEI Webinar held on Feb 10, 2011 available here. Furthermore, a new overview article has been published in IEEE Software article. SOAD overview at SOA Keynote Event in Zurich (October 27, 2010) and OOP 2011 in Munich (January 25, 2011). At SATURN 2010, SOAD received an IEEE Software Award for new directions for architecture-centric practices. Navigate to the update tab to download the presentation and tutorial material. Architectural decision modeling case study published in a text book on Software Architecture Knowledge Management. The case study chapter can be downloaded here. SOA Decision Modeling (SOAD) concepts and content featured in depth in a Ph.D. dissertation (in English!) and a JSS article. New overview article on architectural decision modeling and sharing available at IBM developerWorks. Software Engineering Radio Episode 85 with Olaf Zimmermann on SOA and Web services released. It can be downloaded here.